Nestled between the mountains and the sea on Washington’s scenic Olympic Peninsula one finds the enchanting town of Sequim (pro “SKWIM”). Its guests are welcomed by a quaint downtown that invites them to slow the pace and simply saunter for a while. Vintage-styled streetlights line main shopping corridors, reminiscent of Sequim’s rich pioneer heritage. Each spring through summer they are adorned with hanging flower baskets dripping in celebratory color, seeded and natured to growth by the local high school FFA program. 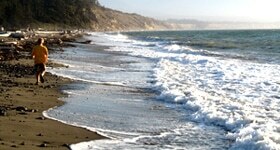 The scenic beauty that surrounds Sequim is an awakening for the senses. One need only look to the horizon to find majestic snow-packed rims of the Olympic Mountains. 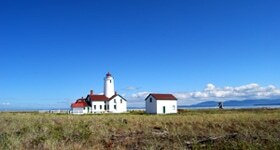 A brief drive takes you to the shorelines of the Strait of Juan de Fuca, enjoyed from several park areas. This scenic beauty combined with Sequim’s moderate climate and broad-based local services makes it no surprise that Sequim was voted “Best Northwestern Small Town” in the 2017 USA Today’s Readers’ Choice awards. The ample opportunities to explore the beautiful waterways and mountains that surround Sequim make it especially appealing to the outdoor enthusiast and active retiree. The Olympic Discovery Trail, a local favorite for enjoying “Sunny Sequim”, is conveniently accessed within ¼-mile of Cedar Ridge. The trail’s wide, non-motarized paved pathway spans 126 miles of shoreline, forests, farms and town roads from Pt Townsend to La Push. The Olympic National Forest features Hurricane Ridge as a focal point for snow and winter recreation. 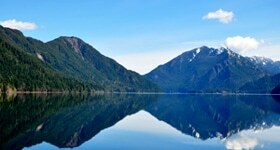 Visit these links to learn more about all that the Sequim lifestyle has to offer. How could a small town approximately 100 miles from the Olympic Rain Forest be known as “Sunny Sequim” and “The Blue Hole”? The short answer is the rain shadow effect, a weather pattern created by the protective rims of the Olympic Mountains. Known as the Olympic Rain Shadow, this elliptical-shaped region benefits from an average annual rainfall of under 20 inches—much drier than surrounding areas—and enjoys many more days of sunshine as well. Sequim receives around 16 inches of rain annually (comparable to Los Angeles) and is said to enjoy a surprising 300 days a year without rain. Sequim retains a small town atmosphere while offering conveniences you’ve grown accustomed to in larger cities. Costco, Walmart, Home Depot, and Coastal are just a few of your cosmopolitan friends that complement the services of the local businesses you’ll surely befriend. Cedar Ridge provides easy access to downtown dining and shopping as well as Hwy 101. For serious shoppers, the Silverdale shopping district is just over an hour’s drive away, and Seattle can be reached in approximately 2 hours. Take the Bainbridge or Edmonds ferry to strategically deliver you while you snap photos of boats at play on beautiful Puget Sound. Adequate healthcare need not be a concern for retirees planning for their later years. Sequim hosts state-of-the-art facilities and top-notch professionals for both a cancer center and therapy/rehabilitation center. These facilities are supported by a hospital in Port Angeles, just 30 minutes west.